From the tortured sands of the Mana Wastes, where magic is as likely to tear you apart as it is to not work at all, to the perpetually frozen northern nation of Irrisen where the winter witches rule, magic is a part of life in the Inner Sea region. Whether it is wielded by benevolent clerics to keep their allies fighting the good fight or unleashed by wizards in the form of scorching blasts of fire, magic can be the difference between life or death. Or, as in so many cases, the cause of life or death. A who's-who of powerful and famous spellcasters from throughout the Inner Sea region. Details on four types of magical schools - arcane academies, spellcaster's guilds, monasteries, and secret societies - along with rules for joining and studying with such organizations. Rules for several types of specialized or variant magic, including the chaotic power of primal magic, the secrets of shadowcasting, the traditions of Thassilonian sin magic, and the wonders of Varisian tattoo magic. Two new oracle mysteries (the primal-magic wielding spellscar mystery and the sinister Outer Rifts mystery). More than a dozen new archetypes for all sorts of spellcasters, including the black-blooded oracle, the Razmiran priest, the shadowcaster wizard, the tattooed sorcerer, and the winter witch. Two new prestige classes - the cyphermage and the divine scion. Dozens of new spells, from Aroden's spellward to zoner of foul flames! 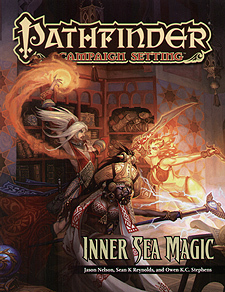 Inner Sea Magic is intended for use with the Pathfinder Roleplaying Game and the Pathfinder campaign setting, but can easily be used in any fantasy game setting.